Do you hear that? It kind of sounds like someone singing, in a body of water, where their feet aren’t touching the ground. Almost as if they’re … far from the shallow? 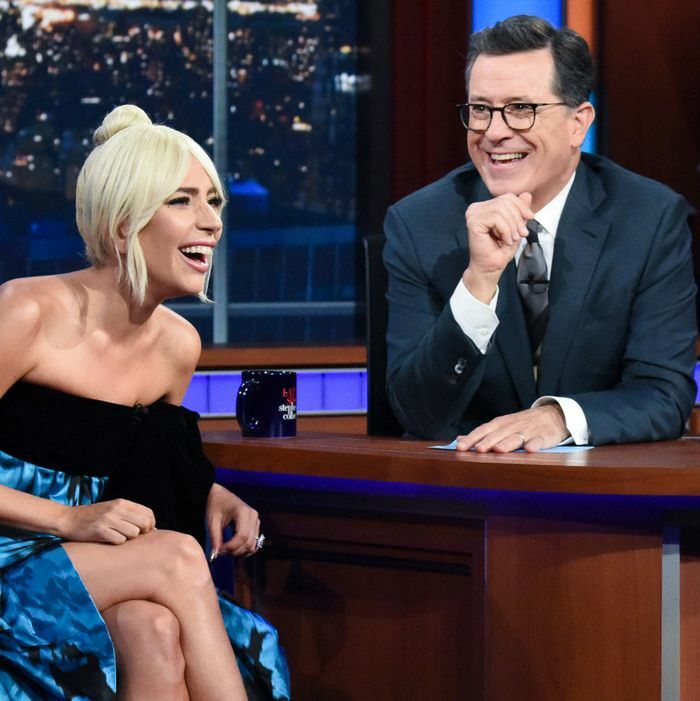 That’s right, A Star Is Born promotion has reached the talk shows. Bradley Cooper, on the other hand, is promoting authenticity. From his recent profile in the New York Times, we know that Cooper believes that true artistic expression cannot exist alongside commerce. His version of A Star Is Born isn’t about a man jealous of a woman’s success, but his despair at her selling out. In the profile, Cooper talks about what is “real” and how A Star Is Born comes from “truth.” A remake of a remake of a remake, that is truth. A celebrity profile, that’s commerce. Real artists chafe at industry conventions, they make fun of social niceties. They refuse to explain their art. But the performance of all this “realness” can be as fake as Lindsay Lohan’s new accent. The lines are especially muddied when the performance of discomfort with fame is on-brand/profitable for the star. Cooper’s appearance on The Tonight Show underscores what an auteur he is. How artistic, how Oscar-worthy! He points out every talk-show convention he can, running the clock on an anecdote, talking about how it’s going to be edited down later, taking a comically exaggerated sip of water. Fallon is his confederate in this performance of authenticity. Only their chumminess goes unquestioned. Fake realness can serve a comedic brand, too. Eric Idle goes on The Late Late Show to sing his most famous song, “Always Look on the Bright Side of Life,” which happens to be the title of the book he’s plugging. It’s a crass and cynical move, and he makes sure you know that. By hanging a lampshade on the commercial aspect of the what he’s doing, he wants you to feel that he’s transcended it. Anna Faris, whether she’s genuinely uncomfortable at red-carpet events or not, makes “yikes” faces every time she’s in a fancy dress. This is relatable content, feeling out of place in a fancy thing. This is marketable content. Mom is about a non-fancy person, so she needs to broadcast non-fanciness to be believed in the role. I’m going to double dip in The Tonight Show, because Jimmy Fallon doesn’t question a star’s persona the way, say, Jimmy Kimmel does. (We are not going to Jimmy Kimmel the situation.) Claire Foy’s appearance on Fallon was half Emmys victory lap and half Oscars-campaign foundation setting. Her anecdotes centered on her selflessness and adherence to what is proper, the two things her characters need to embody. The cute stories — about not getting into an Emmys party and giving up her Springsteen tickets —underscore an idea that Foy is tapping into her truest self to portray self-sacrificing women like Queen Elizabeth and Neil Armstrong’s wife who probably has a name. It’s the “no makeup” makeup of talk-show appearances, seeming effortless while still serving a narrative. Is Claire Foy really a good daughter and a deeply British person? It’s entirely possible. But what matters more is how bankable that persona can be. Celebrity branding is a dumb thing to care about. But if I’ve learned anything from Malcolm Gladwell, it’s that a bunch of dumb things put together can become something smart. The language of authenticity is but one slice of how our society decides who to listen to, who to believe. We have decided what a real narrative looks like, what a real story sounds like, and it is having dire consequences. Bradley wiped the makeup off Gaga’s facebecause he wanted her to be his version of real. But on Colbert, Gaga said that her glam look was more authentic to her experience. Politicians are lying to our faces and assume they will get away with it, because they have the aesthetics of credibility. Authority has always looked like Old Guys, but that’s as artificial as any other surface judgement. What we need to do is crash through the surface, where they can’t hurt us.